Varies by users, contract duration, payment terms. Mindscope is the innovation leader in staffing and recruitment software. It leads the market in candidate, client and job management functionalities. The system includes an industry specific CRM system, a mobile app, and offers hundreds of strategic integrations including text messaging and social media posting. Mindscope is recognized for its top-of-the-line customer service, high overall product quality, user-friendliness, and extremely flexible customization capabilities. Comments: ALL my technical issues get resolved quickly by the best team (usually it is because I forgot how to do something)! Like anything else with technology, I don't want to know it is there, I want it to work and in almost two years, I can't remember the database being down and if it was it was not impactful. Great job Team ! Cons: The current version of MindSCOPE CURA functions as promised and delivered. Two areas of improvement (we were told change is coming) is when working through search results, it can take 2-seconds for the next record to pop up. To view the next candidate's resume is immediate. Some functions require too many clicks. Both issues are truly minor. Pros: I've used Mindscope/Cura for almost 7 years and it's grown in it's abilities and features exponentially. I like the ability to connect directly with Outlook and how it can take my conversations via email with a candidate and automatically sync it into the candidate's profile. I also like being able to enter in individual resumes directly from my Outlook, but I still have the ability to parse large amounts through Batch Paris. I have really enjoyed being able to merge multiple profiles for the same person rather than having to remember which specific one I want to work from. Finally, the texting feature has been incredible beneficial. Cons: We are still working through some kinks currently, such as the .NET feature keeps un-installing and (on certain computers) take a long time to bring up individual candidates or clients. The search feature in the candidate module can be temperamental and will sometimes not recognize specific words OR will get angry if a bullion search string is too long. Also, there's a weird issue with responding to text messages to a candidate in Cura if the initial sent message from the candidate is over the allotted 160 characters. You have to first delete the candidate's message out of the box and then hit reply. Comments: Our company is an IT services company specializing in full service/solutions in the area of ERP, mainframe, J2EE, business intelligence, data warehousing/ETL and project management. Our success and growth over the last 10+ years is attributed to some strong relationships and business strategic clients. It was one of our strategic clients that asked us to entertain some new business opportunities in staffing, which resulted in our search for an Applicant Tracking System. It has been an absolute pleasure working with everyone at Mindscope to implement, customize and learn the CURA system. Prior to this new requirement, we had no need for such a system, so essentially we were starting with nothing and yet we had a very important client waiting for us to engage in this new business. Our team is small and we were very concerned about the amount of time spent on entering data, duplication of effort, keeping all parties informed easily, reporting, maintaining documentation, etc. We want to maximize the time we spend with our candidates and clients by minimizing the time we spend updating a system. In addition, we were considering some longer term possibilities to expand the system for other clients. Lastly, having flexibility to customize the tool without impacting our ability to take advantage of future release enhancements was a critical evaluation criteria. CURA satisfied all our requirements! When we saw the new Broadbean technology we were even more impressed and it became an easy decision for us. We are now using CURA version 5.8.0.0 to run our new business! The implementation was very easy and quick. The implementation and training support personnel were extremely professional, responsive and knowledgeable. When it came time to complete the web integration to our company website, we had another CURA expert assist with that work and it was working within a couple days. In summary, we are very happy with our decision to acquire CURA and looking forward to increasing our business using CURA to enable and support the growth! Pros: Much to our shock and great delight, all of the things we'd been promised prior to go live actually happened! The onboarding process was smooth and handled brilliantly. One of their staff flew over from Canada and spent a week with us in our UK HQ. Following the go live, we've had no issues worthy of mention. Any queries or issues have been user / new system orientated and we have received whatever support has been required. Our consultants love the product and were delighted with the choice we made. To top it all, it's very reasonably priced! I feel we have paid for a VW and ended up with a Bentley! Couldn't be happier. Cons: CURA has worked well for our business with its culture of investment and product development at the heart of their product offerings. Comments: I work for a specialized staffing agency, our focus is on temporary healthcare staffing; because of the degree of our specialization, our requirements for an applicant tracking software are also very specific - the folks at MindScope understand that. 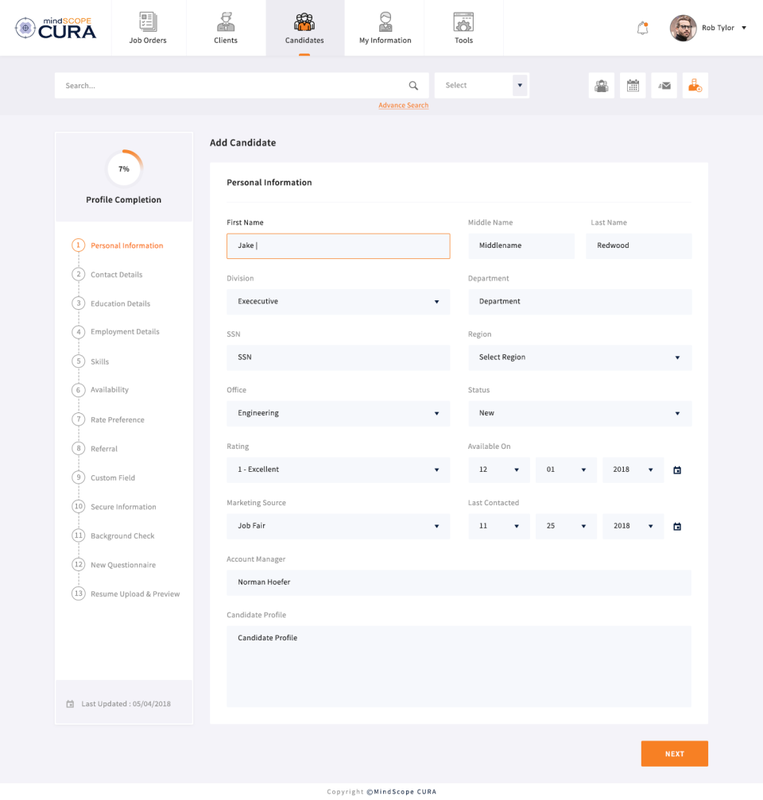 Our main focus in initialing choosing CURA was its flexibility and customizable nature, in addition to it being a web-based ATS as opposed to server-resident that allows our users to access information from any PC, anywhere. Prior to migrating to CURA, we used the Legacy version of MindScope's ATS. In total, we've been using MindScope products for a total of 12 years, with CURA having been in use for more than five years. Our initial implementation was a rather involved process, as the migration involved our very extensive database of candidates and clients. As it was my personal responsibility to review every single bit of information and either delete or approve for migration, I can attest to the vast amount of data involved. Fortunately, the MindScope team was always available to us, and was extraordinarily helpful and responsive during the data conversion. While it was certainly not a rapid process, I can't recall any serious issues with downtime or anything else objectionable. The learning process after migrating to CURA was not an issue. I would attribute that to CURA being a well-designed, intuitive product; the fact that our particular user group is comprised of experienced MindScope Legacy users didn't hurt, either. We have experienced outstanding customer support from MindScope over the entire course of our relationship; their representatives are knowledgeable, informed, courteous, and professional, while being open and friendly. 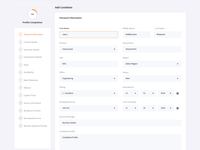 I would highly recommend the MindScope team and their products to anyone who is seeking an adaptable, intuitive ATS backed by consistently excellent customer service. Comments: Charles Foster Staffing & Executive Search is a local, women owned, business in Charleston, SC. We specialize in the placement of professional candidates in an array of industries. We have used Mindscope for more than 10 years from its Legacy (server based) version to its online CURA version. The market for similar software is competitive and I believe that our loyalty to Mindscope over the years speaks volumes to their product, customer service, and customized training. As a result, we have not considered making a change as CURA manages all of our needs, and then some. We went through the transition from the server based version to the currently used online version. The volume of data was extensive and the accuracy in which that data had to be converted was no simple task. I found the Representatives at Mindscope to be incredibly helpful and responsive to our needs throughout the process. Three members of our staff visited Mindscope's office in Canada for specialized training. It is always nice to meet your business partners and vendors face to face, and this was no exception. As expected, we were met with a high level of professionalism and thorough training catered not only to our company, but each individual user as well. Mindscope is always one step ahead of updating features that we may not have realize we needed. They are pro-active in seeking out more effective and efficient ways of utilizing their software and have always been open to suggestions from the end user. Their customer service is impeccable and it is safe to say that we are extremely happy with our experiences over the years. 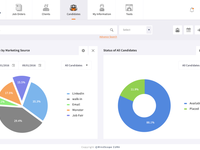 Mindscope will continue to be our software for tracking candidates, recruitment, sales and data management. Pros: Technical support desk respond in a timely manner. Cura interfaces well with phone system. Not to big to listen to user suggestions, and had incorporated good ideas in future releases. Customization possible. Easy searches, candidate matches. Cons: As with any software, our biggest issue was initial buy-in from our staff at time of implementation. Once software was learned, everything went smoothly.. Comments: It does what is says it does, so we are happy. Pros: Able to easily customize to your individual needs. The staff are very easy to work with. Technical Support is knowledgeable and responsive. Cons: Honestly, my only con with the software is that we don't utilize it to it's fullest. They are continuously updating and improving their software, which is great. I believe that sometimes the training on the updates could be more detailed. Comments: We use this currently in a straightforward way. Review is based on this. Will also be implementing this with a large project with a more complicated setup. Pros: Ease of use. Customizable to your needs. Company ready to accommodate. Can also integrate with CRM. Cons: The graphical interface needs to be updated, which I believe is in the works. Need IE for direct mass CV imports. Comments: CURA makes my job easier and helps me stay better organized with my candidates. Pros: I love the parse from email tool. It is an amazing addition and so easy to use. Makes updating candidate file very easy and efficient. Cons: Sometimes i have issues with resumes displaying properly but that is usually due to software updates or the format of the resume. Comments: Great support from your team! Very intuitive which makes it easy to learn. Pros: I love the searching capabilities within Cura, and the easy web integration for posting open orders. Cons: There isn't much that I don't like about this software; perhaps some features are missing from the mobile version. Pros: Excellent service. Software is very functional and has a ton of features. Staff is committed to ensuring you are using it to it's full capacity. Cons: Customizing can sometimes prove challenging. Had a hard time moving over data from old software. This is the best move we've ever made. Comments: Great system. Meets our needs beautifully. Pros: We can now focus on filling jobs rather than figuring out "workarounds" where our previous system was lacking. The reporting functions are fantastic. Cons: There's really nothing that we dislike about the system. It was a drastic change from what we had used previously, so there was a learning curve, but everyone caught on very quickly and would never consider going back. Pros: The product is really easy to use, the support staff is really helpful and fast in finding solutions. This is a great product and has made our work a lot easier! Cons: The only thing I would be able to say for the "cons" would eventually be the user-interface that isn't the "prettiest" but the goal of this software is to be an effective time saving solution and not a "beautiful" product. Comments: Quest is the largest white collar flexible staffing agency in South Africa. Quest deals with high volumes and needed a system to support the high volume/low touch environment. It became an imperative to find a more efficient and effective way of managing the business. Excel spreadsheets in a plethora of forms and places were doing nothing to institutionalize the supposed core competency. We did extensive research to find a system that would be easy to bolt onto our MS ERP, would have 80% functionality off the shelf, would allow more configuration than expensive customization, and would give us excellent after sales service in distant South Africa. Oh! And all this had to fit our budget! Hands down CURA ticked all the boxes and then some. There was not a single other offering that scored even close to CURA. The one unknown was would they actually deliver. For the first time in my many years of working with IT projects, CURA was delivered on time, and with the most responsive IT team I had ever worked with. Added to this, they broke down needs and requests into an easily understandable language so they did not have to rely on my IT gibberish. I have subsequently used CURA in the next project I worked on and am about to use them again! This is a company that delivers on every single promise! Comments: Customer support is phenomenal. support team has been so easy to work with and is available whenever we need anything. Pros: I'm learning to love it. It has been a growing and learning curve for our corporation. I am not on it often in my position, but when I am it's an excellent tool. The staff members who use it state they really like the Mindscope/CURA program. We are looking forward to growing with it from both an HR perspective and Marketing as well. Cons: I can't say there are cons. I'm not on it enough to say I've had any. And I've not heard complaints from other staff members. Comments: I have recommended this product to friends in the industry both in the agency business and in consulting (like our company). 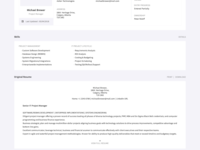 Pros: Mindscope gives me all the functionality our company needs for our Talent Acqusition process. They worked closely with us to customize their product to meet our business process and after sale service is exceptional. Cons: Is a little bit behind on some of the newer technology initiatives that are occurring in the ATS marketplace but they seem to work hard to bring it up the date. Pros: In selecting software products, we had a long wish list of criteria. Of the five or so products we previewed, by far, CURA came closest to fulfilling our needs. Texting capabilities, interacting with our QuickBooks accounting software, and the smart way it builds our database and allows our clients to sign forms online have made our tasks more professional, efficient, and productive. Cons: Some of the functions that made this software so attractive for our purposes have been add-ons, such as texting and the ability to sign forms online. Initially, navigating through all of these processes has been cumbersome. Recommendations to other buyers: Give yourself plenty of time in the implementation stages. Our learning curve/implementation processes have been about six months to have everything up to speed. Pros: CURA is completely customizable to meet your specific requirements. The team at MindSCOPE worked with me to fine-tune CURA to my exact needs. I am a small business, but they made me feel like I was their only customer. They have awesome customer and technical support; it's a great product and a great team. You can't go wrong with CURA from MindSCOPE. Cons: Not much but if I had a complaint (and I'm told it will be resolved in the next update), it would be that it doesn't function with browsers other than IE. The next update will allow it to be compatible with other browsers, so this will go away. Recommendations to other buyers: Do demos and talk to the vendor. You are partnering with them, and you want to make sure they can deliver. Plus, it doesn't hurt when you work with nice people. One hand knows what the other is doing! Pros: I find CURA to have a user-friendly interface and versatile ease of use. Although initially the "multiple ways to skin a cat" approach can be a little confusing for technophobes, it does provide a lot of options to customize the database based on the company's needs. The staff at CURA is very friendly, accessible, and helpful. Cons: Compared to our previous software, there are a few extra steps required for certain processes, which is a bit time-consuming, especially with the learning curve. Personally, I find the benefits far outweigh any negatives, though. Recommendations to other buyers: If you do demo this software, be sure to verify specific needs in terms of credentialing processes, back end etc. There is much that can be customized, but within the limits of the product. Pros: Many staffing software options on the market today are very good at one thing - perhaps serving as a database for client and candidate recruitment tracking - yet they are not-so-good at another - let's say staffing job order tracking. Or vice versa. CURA manages to bring the best of both worlds and does so with a knowledgeable support staff. This is a requirement for our company, since we handle a wide spectrum of job opportunities, ranging from temporary one-day assignments to multi-year contracts to permanent placements. Cons: We're still trying to break it but haven't yet succeeded. Recommendations to other buyers: We are very pleased with the flexibility of the product and the MindSCOPE staff to accommodate our needs. Take a test and see for yourself. Great software with the features you really want. Pros: The parsing of resumes and information on line. The saving of resume views as it checks if someone is already in the system. The email integration is the best we have seen. Cons: Very little cons. Maybe the price is more than others but the software is better. We wish the conversion was not so much as we have a large database on old software so there is a large cost that is unfortunate. Comments: Our company recently set up an account with MindScope CURA software. 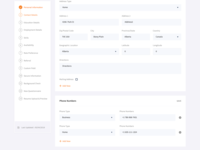 We have been extremely happy with their response time for the implementation of our user package. We feel that they have become part of our team in continuing our goals of success. 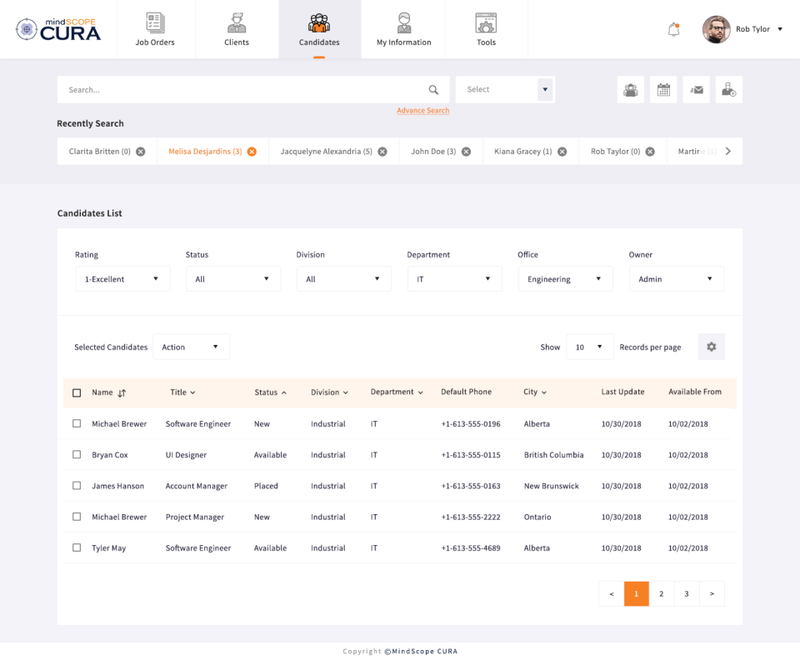 The CURA package has enabled us to greatly reduce our candidate process times, while also enabling us to better control our documentation and communication with our candidates. Our search capabilities have become endless with CURA, as well as our capability to rapidly place job postings to our website. The CURA support team has been extremely responsive to all of our request and provided excellent training sessions to our users. We look forward to growing our business for many years to come and having MindScope CURA as a vital part of our growth process and success. Cons: We were promised that it could/would integrate with all these other systems we use and it has not. The search capability is some of the worse I've seen. It does not come up with relevant candidates at all when I am searching by keywords...and don't even try to search by location!! When they mass uploaded our resumes, it must have filled locations in all wrong. Pros: We reviewed other systems but found CURA to be the one that matched our specific needs. 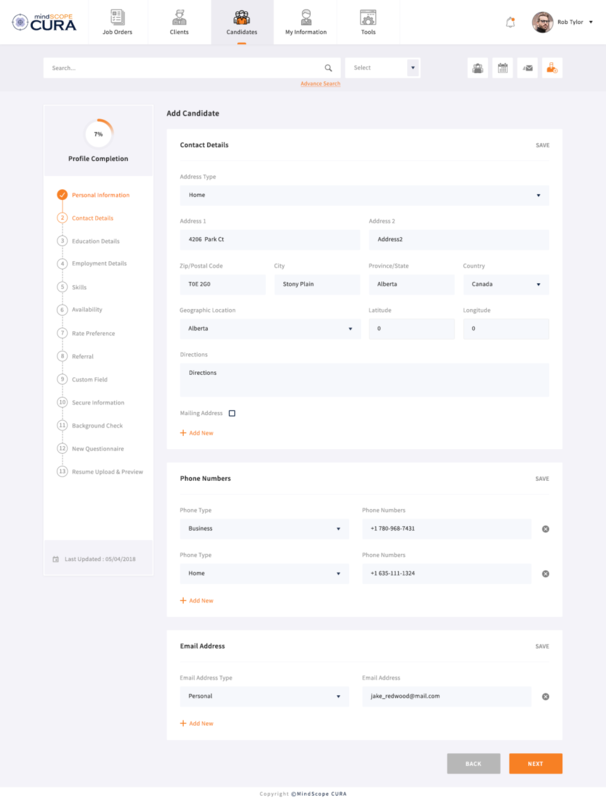 It's customizable enough to match our upcoming growth plans. It cuts our administrative work in half and sets daily routines and goals easily with a follow on CRM activity based success orientation. Cons: Mindscope was very easy to work with. They have an open, honest approach, listened to our needs, are flexible and responsive. It's a great ATS! Recommendations to other buyers: Know what business processes will be affected and map those to the software. Then you can streamline and customize for optimal efficiency. Comments: It's been a great experience working with Mindscope. I don't plan on switching systems anytime soon. Pros: There is a lot of functionality and they are always adding more. They are open to hearing our suggestions about improvement. Cons: There might be to many options. I feel like we only use a small percentage of the program can offer. Pros: It's a very robust all-in-one system that covers every angle for staffing agencies. We love this product and myself have used quite a few systems. Cons: The turnover within the company. One day your working with one person the next another. Recommendations to other buyers: Just make sure you cover every aspect of your business and how the software can compliment it with its applications. Comments: MindScope has been one of the best additions to our business. From customer service to technical support, the experience will set your business apart from the competition. Their vision sets a new benchmark for the industry. Their actions have consistently proven to be a success. 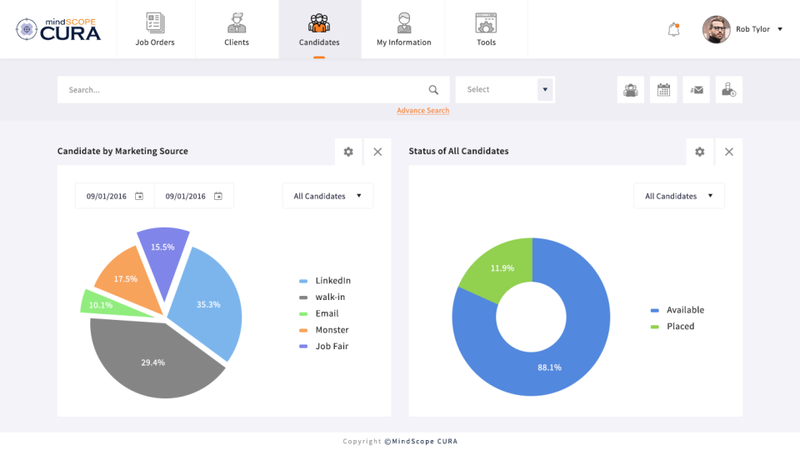 From marketing tools, to the reporting system, to the actual resume database - it is very simple to use and compacts all the important features, thus creating the visibility you are looking for. I strongly recommend any company looking to improve their customer service to include this software in their business. Comments: OnPar Solutions is a relationship brokerage firm primarily focused on Permanent and Contractual staffing solutions. 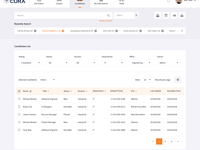 In search for a the right CRM, Mindscope proved to be the most versatile in adapting to our model which differs from what a Staffing Agency would require. The on-boarding process ran smoothly with great support from their customer service team. After initial set up and modification to our needs, training new users became a breeze. We are extremely satisfied with our decision to move our system over to Cura and hope to work with them for years to come. Pros: Their service, attention to detail, foresight relative to updates, and professionalism all combined cause me to conclude that Mindscope is customer-focused and that they operate with the highest level of integrity. The CURA product exceeds my expectations. Cons: I can't think of any negatives. Really! Recommendations to other buyers: Evaluate your specific needs, relay the information to the service and technical staff, and they will customize the system to your specific circumstance. Comments: Great product whether you have a large implementation team or a one man show! Support staff was very helpful and the customer service experience is consistent between departments. 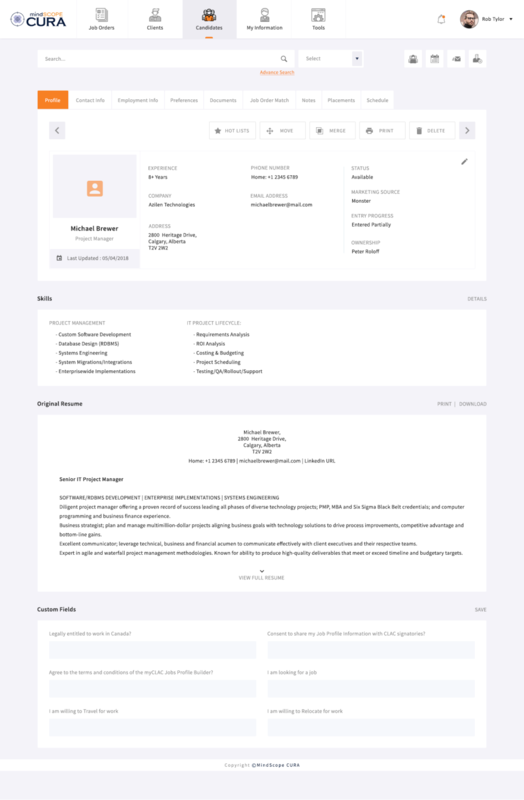 Pros: It's easy to put resumes in and add vendors into database. Cons: There are a number of things we have not been able to add because there are only standard answers. Comments: We have a small recruiting business and looked at several software applications prior to deciding to work with Mindscope. The software is user friendly, and the training and support after have been fabulous. I have been very pleased with the entire company from the CEO to the Help Desk. You won't be disappointed if you decide to work with Mindscope for your software needs. Top Notch Service & Capabilities! Pros: The entire team has exceeded our expectations. You can tell that each person enjoys the work they do and cares for the success of their customers. Cons: We are completely satisfied with CURA. Recommendations to other buyers: Look for a software system that matches all of your needs. Cura is helpful but can use some changes. Cons: Repetitive, enter the same info on multiple screens. Recommendations to other buyers: Cura is a great software system and can be customized but is not 100% user friendly. Cons: I would like more colours, but they've now added this, so nothing else. Recommendations to other buyers: I now go home at 6pm instead of sitting there clicking on CVs until 9pm at night. I have more of a life because it's saved time. The CV parsing is excellent. It's simple to use and nearly every part of the software - you can tailor to suit your needs. Mindscope is a great product for a company to stay organized. Pros: I like how it stores lots of data and is easy to use. Cons: Sometimes, when logging on, it takes about 3 - 4 minutes to enter in the program. Pros: Tons of great features; friendly help staff. Pros: The vendor has very good support and the product adapts well to our recruitment procedures. Cons: The system is not completely translated to Spanish. We expected to have a fully bilingual software. Recommendations to other buyers: To have a demonstration on the language of preference. Comments: Would be worth considering, and I'm under the impression that they are working on their UI development. Pros: It seems like the database is super segmented and modulated meaning you can have alot of flexibility using the system and customization. Cons: The UI is like using a windows 2000 PC. Definitely not easy to understand or use since its robustness takes away from its simplicity and intuitiveness.